You’ve come to the right place if you’re looking for kindergarten number worksheets! 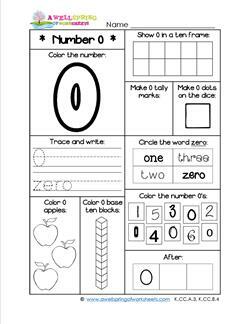 We’ve got a large selection of worksheets for numbers 0-20. 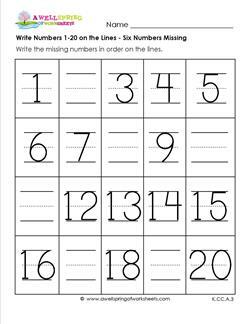 Kids can fill in the missing numbers, trace the numbers, write the numbers, color the numbers and write the number words. Of course, as children talk about numbers and learn their numbers they also learn to count in sequential order. Because of this, I would also recommend you take a look at our large selection of kindergarten counting worksheets. 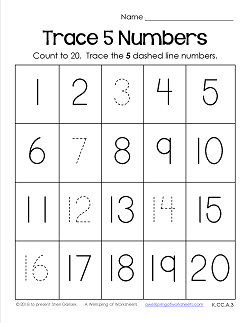 Go to this page to choose from all the number worksheets on this site. Talk about fun! 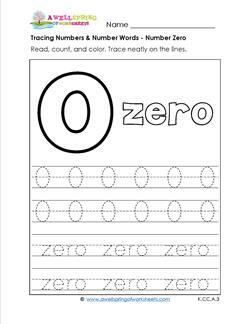 These number worksheets get kids thinking about, writing, and identifying numbers 0-20 in many different ways. They color in the large number, show the number in ten frames, make tally marks, put dots on the dice, count base ten blocks, circle the number word, identify before and after, count the number of objects, trace and write the number, and trace and write the number word. Whew! That’s a lot of things to ask kindergarteners to do. Be sure to tell them what an awesome job they’ve done! 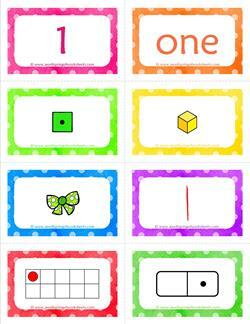 This number cards matching game is so fun! Want your students to be able to recognize a number in more than one way? Well, these cards can be matched in one of eight ways: a numeral, a number word, dice, base ten blocks, objects, tally marks, ten frames, and dominoes. Use two of the sets like the dice and the number words and have kids match them up . Have them put the cards with objects in sequential order. Lots of options here! Print on card stock for longer lasting cards. 20 pages of number cards, 8 cards per page, 160 in all. 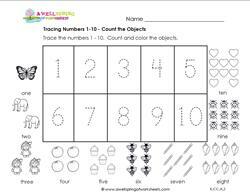 These tracing numbers and number words worksheets add a bit of fun to writing numbers. Kids get to count the objects and color them…and they get to color the large bubble font numbers and number words. Will they color them all one color or rainbow colors? Then on to using the pencil and the diligent work of neatly tracing begins! They trace the smaller numbers twelve times and the bigger numbers eight times. The number words appear four times for the bigger words to up to eight times for the smaller words. 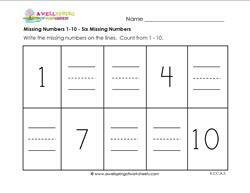 In these fill in the missing number worksheets for 1-20, kids don’t need to trace the numbers or worry about writing neatly on the lines, they just write the missing numbers in the boxes. Great counting to 20 practice as well. 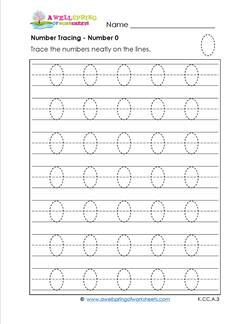 Use these for everyday classroom practice in sequential order by filling in only six numbers first and moving on up to filling in all the numbers. Or use them for your different levels of learners.